Description: Penny Plourde was born in 1953, and grew up in Ft Kent, in Maine’s St. John Valley on the Canadian border. She has been involved in civil rights and disability rights movements. She has served as the Director of the vocational rehabilitation unit at Maine’s Department of Labor and worked for the Maine Department of Transportation. The daughter of a Maine legislator, she ran unsuccessfully for a seat in the Maine Legislature. PLOURDE: Many people think of disability as something sorrowful, bad, and would never wish it on anyone they knew, but it my case, my disability gave me opportunity to see the world and be part of the world in ways that most of the time I have not been able to do. NARR: Penny Plourde was born in 1954, in the St. John Valley, with spinal bifida. She uses a motorized wheelchair, and looks around her and sees opportunity everywhere. She embraces the era of the baby boomers, ticking off the cultural touchstones of the era–rock and roll, civil rights, anti-Vietnam War protest marches–but when Plourde was in school, the disability rights movement was yet to gain a full head of steam. The Deaf President Now and ADAPT demonstrations were still some years away. Plourde remembers being nearly the only child with a disability in her home town. Her parents understood the value of socialization, but local school administrators wanted to set up a plan for home schooling. PLOURDE: Because they were fearful that I would fall, or that I would injure another student, and the school was not accessible. It had a series of steps. They really felt strongly that it was not an opportunity for me to go to high school. It would have been a burden for them. So they wanted to set up an arrangement where I had tutors come to my house, and my family wouldn’t have anything to do with that. So ultimately, opportunity for me means exploring. Doing things that others can do, but do it my way. NARR: A child of the sixties and seventies, Plourde took lessons from the world around her. PLOURDE: Every woman, every male, every child can be disabled. And so the women’s movement to me was also a movement that helped disabled women begin to get out in the world. The civil rights movement taught us, or we the disabled, in many ways that if we want something, we have to fight for it. Because nothing comes easily when you have a disability. NARR: There is, she says, a challenge every day. 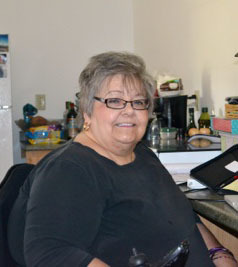 One of the first challenges she took up as a disability rights advocate was a seat on the board of Alpha One, the first independent living center for persons with disabilities in Maine. PLOURDE: In part, it stemmed from my skill set, my knowledge of disability issues, my belief in opportunity, and exposure to other social issues that other people participated in, and why is it that if you want to go to a library, and you’re a disabled person in a chair, you can’t get up the library steps. So why is it that you have to have steps? Why can’t you have a ramp? Why can’t there be an elevator? There are other means of access, but so many of the architects and builders of yesteryear didn’t think of disabled people in the world. They thought of disabled people as being cloistered and shuttered, shutted, which I just didn’t want to believe, and it never dawned on me that I was being part of a civil rights movement. What I thought was I was being part of helping individuals and myself being able to have-quote–normal–unquote lives. NARR: Another challenge was her recent bid for a seat in Maine’s legislature. Her father was a legislator in the 1970’s. She served as the director of the Vocational Rehabilitation Unit in the Department of Labor and often testified at hearings there. PLOURDE: And within that, just being seen at the legislature caused people to stop and think. And slowly people were beginning to elect folks who had disabilities, but not a lot, and not disabled enough that desks had to be rearranged, or committee rooms had to be–committee room doors had to be widened, or there needed to be interpreters. And that slowly evolved to help me decide that I wanted to run for the Senate. NARR: Plourde sometimes found it difficult to engage the voters. PLOURDE: I ran from my wheelchair. I couldn’t do house to house canvassing as so many candidates do. I had to have an individual go up to the door, knock on the door, ask the homeowner to come out to visit with this candidate. Most of the time people did. Other times people said, in not so polite ways, and in other ways that they weren’t interested in talking to a disabled person about running for a state legislative seat because, “How was that person going to do the job?” Never once stopping to think that it wasn’t about walking, it wasn’t about riding, you know, in a wheel chair, it was about using your mind to help create policy that would make a difference in this state. NARR: Plourde’s legislative bid was unsuccessful, but she says her campaign was at least an opportunity to educate voters. Speaking of the ADA, she expresses some disappointment that the ADA has not made a more significant difference for people with disabilities. PLOURDE: The ADA gave us a template, if you will–a bible that outlined how to make everything, if you will, as humanly accessible as possible. It gave us minimum standards, it gave us maximum standards. It gave us information about how to make a vessel accessible, how to make a train accessible, how to make a lavatory accessible, how to make a work environment accessible. But people whose eyes were trained not to see disable people don’t understand that we’re not going away. We are here. NARR: She says that despite the ADA, we are still building buildings that are inaccessible. Even before the ADA, in the 1970’ s, some were demonstrating how accessibility can be achieved. PLOURDE When I moved to Augusta, and I needed an apartment, there were no accessible apartments. I met a landlord; went and looked at his building and asked if he would be willing to put in a ramp, and he said, “No problem.” There wasn’t a question. He said, “No problem.” And he did it. NARR: It is a matter of looking at buildings and transportation systems and changing the way we think about them. PLOURDE: They’re not accessible, they’re not open, they’re not welcoming of disabled people. But once you start breaking barriers down, you begin to see more opportunity. Because people are seeing, believing, and feeling that the disabled community are engaging.